Let me introduce you to the two characters of this play. One of them is Jo, the one who likes to drive cars and likes cars that drive him. The second is Mo, who prefers to be driven around, to lounge in the back seat and raise a concerned eyebrow over the rupee falling against the dollar. Together they are going to settle a battle between three executive sedans, pick a winner which appeals to both their tastes. Let's introduce the contenders. The first, getting the privilege for being the newest on the block, is the Hyundai Sonata. This is the sixth generation Sonata with the fluidic knife applied to it. The second competitor is the Skoda Superb Ambition. Skoda have taken away some of the features from their flagship model but have also reduced the prices by quite a bit. The third contestant is the Honda Accord. The vehicle that laid down the standards for this segment. How will it shape up against the new kids on the block? Let's hand it over to Jo and Mo. Act One. This is a segment where what's on the inside of the car is as important as what is on the outside. From the outside the car should provide the aspirational value to the onlooker and on the inside provide the comfort that befits a suit. It is through these lenses that we need to see the competitors. The new Sonata has gone under the fluidic knife and has come back looking meaner. The big beefy grille with the Hyundai logo nested in the middle, the big flowing headlamps (gone are the old Merc C-Class headlamp lookalikes) and the cuts and swoops which converge give the new Sonata a lot of volume up front and makes it look aggressive. This design language continues on the side with the sharply rising shoulder line which ends in tail lamps which look sleeker as compared to before. Overall a much more aggressive car as compared to its predecessor and one that has the presence demanded by this segment. If the Sonata was all angular the Superb follows straight lines. The headlamps and the grille will fit between two parallel lines and similarly the fog lamps and the air dam. A simplistic look which continues to the side and onto the rear where the tail lamps cut into the boot to break the monotony. On the whole it has a very minimalistic approach and a design which is in need of a refresh. But they should keep the high nose, in my opinion. Gives it a bit of an attitude. Onto the Honda Accord then. This car has been the king of this segment with an universal design that appeals to everyone. It has enough cuts and swooshes to keep you interested but it doesn't get loud at any point. From the elegant looking headlamps to the chrome strips on the grille the Accord has a very business class look to it which continues at the rear. So now to our jury. It's a category in which both Jo and Mo agree that the new Sonata is clearly the winner. It offers the sense of flashiness which this segment demands. The Superb and the Accord look dated and in need of a refresh. The Superb was launched in 2004 in India and got a refresh in 2008 but it is the plainest car in this comparison. The Accord was launched way back in 2001 but got a refresh in 2011 and that puts it in second place. Act Two. Step inside the Sonata and the flowing design language of the exteriors is replicated on the inside too. The beige-black finish of the cabin gives it a premium feel while also making it a practical approach. The seats are plush and you sink into them. The centre console is new and is a marked improvement over the old design. Move into the rear seat and the Sonata makes you feel like a king back there. Apart from the ventilated seats at the back, the other interesting bit is the centre arm rest which offers you cup holders and buttons to control the audio system and the air flow from the vents. It is the largest unit amongst the three cars but you can play your own tracks or even switch it off if your driver is playing an irritating song. Two aircon vents placed in the centre provide the cooling. It is the car which has the least amount of transmission tunnel intrusion and can accommodate a third person if required. One of the problems though is that the interiors look very similar to the less expensive Verna which is not something that will go down well with the Indian crowd. The Accord cabin looks functional in comparison to the flair present in the Sonata. It too has a beige-black finish but the age is beginning to show. The wood panels really need to go. The centre console has too many buttons placed too linearly for today's world. The rear bench can seat only two because the transmission tunnel comes in the way. The centre armrest gets audio controls like in the Sonata but you can't switch off the audio system here. The cabin looks dated only in terms of design. In the functional sense it still delivers perfectly. The seats are firm enough to keep you comfortable for long journeys. The Superb doesn't like beige. So you have white leather upholstery which immediately gives it a premium feel. This being the Ambition variant the touch screen infotainment system has been replaced with a normal one. The centre console does look dated and it does have those wood panels but it still doesn't look as old as that of the Honda. The gear lever is the smartest looking of the lot. At the back you get a centre armrest but it doesn't have audio controls. You get pop-out cup holders instead. The Superb too has a transmission tunnel and hence seating more than two is uncomfortable. But this is the only car which has air con vents on the B-pillar which means better cooling. Also, in my opinion, a must in a country like ours. It also is the only car which has blinds behind. A must in a country like ours. But the biggest advantage is the massive legroom it offers. While it is the shortest car in terms of wheelbase it still offers the most space. When presented with the problem both Jo and Mo were again in agreement. The Hyundai offers the most features and looks the most modern, the Accord is dated but the Superb with its immense space wins the battle here. It gives Mo the space he wants and the comfort he wants, especially with the firm seats which will help you cover long distances with ease. And that extra vent and the blinds keep you cool. And if you want to change the song just ask your driver (or bark at Jo). Act Three. The Sonata now comes with a 2.4-litre direct injection petrol engine which produces a maximum power of 201PS at 6300rpm and has a maximum torque of 250Nm at 4250rpm. This engine is mated to a six-speed manual transmission. The Accord has a 2.4-litre petrol engine which produces a maximum power of 180PS at 6500rpm and a maximum torque of 222Nm at 4300rpm. It is mated to a five-speed transmission. The Superb has a 1.8-litre turbocharged petrol engine which produces 160PS between 4500-6200rpm and 250Nm between 1500-4500rpm. This is mated to a six-speed transmission. Now that we have the figures out of the way, let's get to what they can do. The 2.4-litre GDI in the Sonata takes 9.4 seconds to get to hundred and has a top speed of 194.82kmph. It has an overall fuel economy of 10.35kmpl. The 2.4 in the Accord on the other hand gets you to the three figure mark in 9.93 seconds and is capable of a top speed of 198kmph. It gives you an overall fuel efficiency of 8.9kmpl. The 1.8 in the Superb gets to hundred in 9.5 seconds and reaches a top speed of 202kmph and returns a fuel efficiency of 11kmpl. The Sonata engine is a rev-happy unit with a linear power delivery. It does have a heavy clutch which comes to the fore especially when shifting from first to second. It is the quickest of the lot but it doesn't feel happy when it's up there. The Accord on the other hand loves to open up. It is the slowest of the lot but the sound of the engine as it revs between 6000rpm and 7000rpm is something that makes Jo drool. The gear shifts are the smoothest of the lot. The Superb on the other hand has a good mid range. It is the second quickest of the lot and it does have the max top speed but crucially also offers the most mileage which makes Mo a very happy man. The turbo really helps the engine not only keep up with the bigger capacity competition but also trump them. The gear shifts are not as smooth as the Accord but they click into place reassuringly. In this battle all the engines are refined but Jo loves the sweet sound of the Accord's but the good low end grunt in the Superb makes it a lively competitor. The Sonata's engine in comparison to these two lacks soul. Act Four. We are now approaching the most crucial part of the story. This is often where most battles are won or lost. Let's get into the Sonata. It has the lightest steering of the lot which is of huge help when navigating through the city traffic. But like in the Verna the trouble starts when the speeds increase. On the highway you feel a disconnect between the steering wheel and the road. It becomes worse when you go over undulations. The car tends to pull to one side after it has gone over a bump and you need to be able to anticipate it or it can get hairy. The ride quality also seems to be tuned for smooth European roads. Over our bad roads the Sonata feels quite stiff and gives your spine quite a generous shake-up. On the highways, at high speeds, it tends to wallow around quite a bit and this can make your rear seat passenger (Mo) very nervous. It's definitely an improvement over the Verna but still has immense room for improvement. The Accord is the established player and this comes out in its ride and handling. The steering is heavy enough to give you confidence at high speeds and at the same time doesn't become a bother when manoeuvring through city traffic. It's also the car which doesn't mind being pushed. It holds its line when diving into corners and plants itself, giving you the thumbs up to go for it. The suspension is supple enough to last long distances. It is on the stiff side and you can feel the thud when it goes over bumps but it doesn't jar your spine like the Sonata does. The Superb with its elongated design is surprisingly the most nimble here. The steering wheel is the best of the lot providing you confidence-inspiring feedback when you are pushing it through corners. Its a car which makes Jo rub his hands in glee. It's the Skoda which guides you through corners (unlike the Laura vRS which threw me off the BIC with great disdain). You get the least amount of body roll as compared to the other two. The steering wheel is also the chunkiest of the lot which adds to the reassurance. The suspension is firm but offers the best damping of the lot which translates into a smooth ride even over bad roads. Final Act. 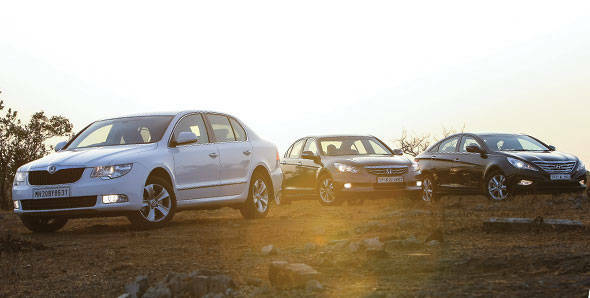 So three cars vying to be the best car in the executive sedan segment. Jo and Mo examined these cars from their perspective and are now ready to give us their insight. Both like the looks of the Sonata and the freshness it brings to this segment. It offers comfortable seats and a centre armrest using which he can launch a nuclear missile but the ride quality isn't something that Mo expects from this segment. Jo doesn't like the steering feedback and suspension set up at all. It costs Rs 18.53 lakh, ex-Delhi. It is the newest kid on the block but it ends up in third place in this battle. It offers you features but the lack of ride quality and handling as compared to its competitors forces it to move back. And so we have the winner - the Superb. It makes Jo smile because of its handling and Mo is pleased with the rear seat comfort and ride quality. And all of this will cost you only Rs 18 lakh, ex-Delhi. It doesn't offer you a lot of features as compared to the Sonata but it offers you what's required, like the rear window blinds or the vents on the B-pillar for example. It has the largest boot at 565 litres with a twin door. If you want to shove something huge into the boot (like Rishaad for example) you just need to keep a button pressed on the boot and then use the normal boot open button. The boot and the rear windscreen open up giving you a vast loading area. It is small factors like these that help it emerge a clear winner. It is a car that understands what the buyer is looking for in this segment and has been able to deliver the best balance here of comfort and handling at a very competitive price. It gets the vote of both Mo and Jo. In short, it has the mojo.